How the time flies by! 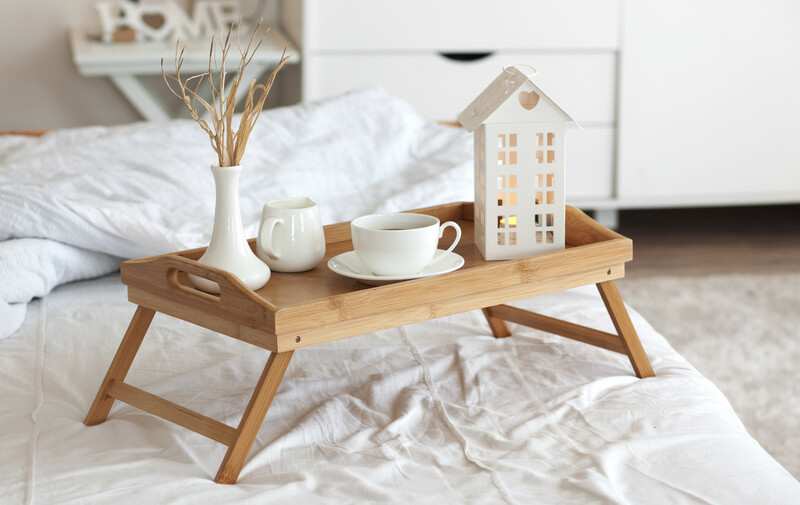 We have been tremendously busy around our house through the months of March and April, which is pretty typical for the Spring season as everything wakes up from the wintertime again. Since our last post, we’ve gleaned quite a bit of new information on Waterbear and seen quite a few sights with Waterbear, including a very first concert and first flight! In this post, we’ll detail weeks 14-20! Waterbear has picked a few favorites in food choices! Over the past few weeks, we’ve had a two-egg on english muffin breakfast sandwich smothered in white sausage gravy every morning, without fail. Waterbear also loves potatoes… in almost every form. So far we’ve had hashbrowns, fries (crinkle cut, steak cut), tater tots, crispy rounds, a baked potato, potato skins, twice baked potatoes and wedges with rosemary. James likes to point out that he does have some Ukranian and Norwegian heritage coming through on his side to account for. Waterbear is definitely a fan of Mexican food, preferring enchiladas and, yes, refried beans and rice. Tacos and spicy salsa are also some lesser favorites, but still make the list. Waterbear is a meat lover, but prefers to keep it lean with different types of fish and poultry, favoring chicken and salmon as staple foods. A chicken-bacon-avocado sandwich is also a restaurant favorite. Waterbear loves heartier meals, based around meat and cheese, and isn’t so much into a salad, much to my sadness since I used to eat a salad for lunch every day up until I became pregnant. I sneak some greens in though! Warm steel-cut oatmeal with crunchy pecans, walnuts and dried cranberries folded in is another breakfast or late-night favorite. There aren’t many cravings for sweet things, sour things or carb-related things (other than potatoes). On our trip to Minneapolis, Waterbear was able to take part in an 18-course meal plate meal at a fabulous restaurant called Trevail. 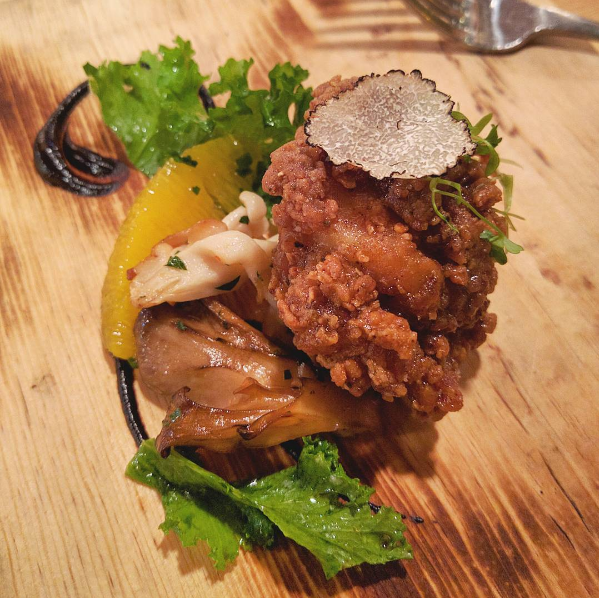 Just one of the plates from Trevail in Minneapolis! Waterbear has joined along in quite a few adventures lately! Since we last wrote, both James and I have been to a few doctor and dental appointments! James snagged new glasses and contacts and we both paid a visit to the dentist. Waterbear tagged along for what was an amazing time at Sakura Con in downtown Seattle. James and I cosplayed some of our favorite characters, attended a masquerade ball and “rave” and got to see the creators and hear about some things to come for one of our favorite series, Sword Art Online. For the Masquerade ball, I was actually able to fit into and wear what was my senior year prom dress! 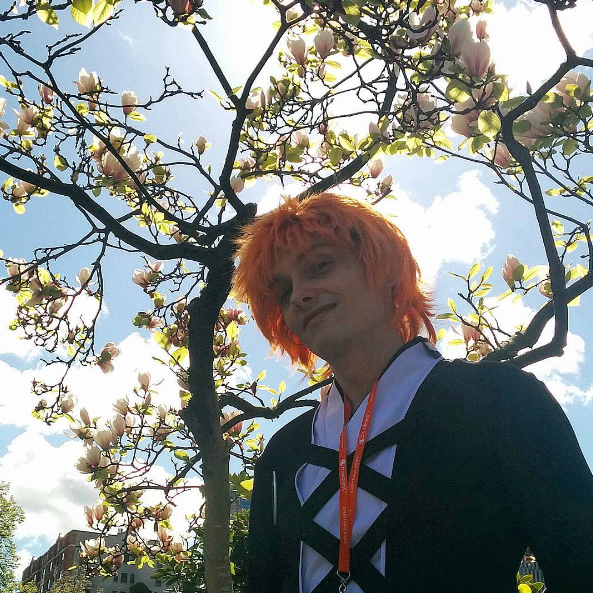 James cosplaying Ichigo Kurosaki’s new bankai at SakuraCon 2016. 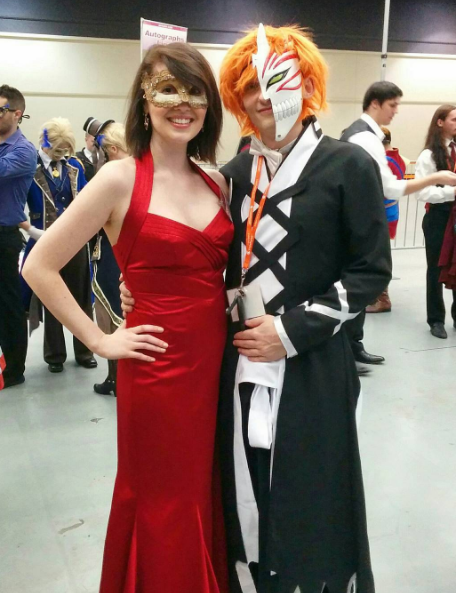 James and I attending the Masquerade Ball at SakuraCon 2016! Waterbear is about 15 weeks along here. 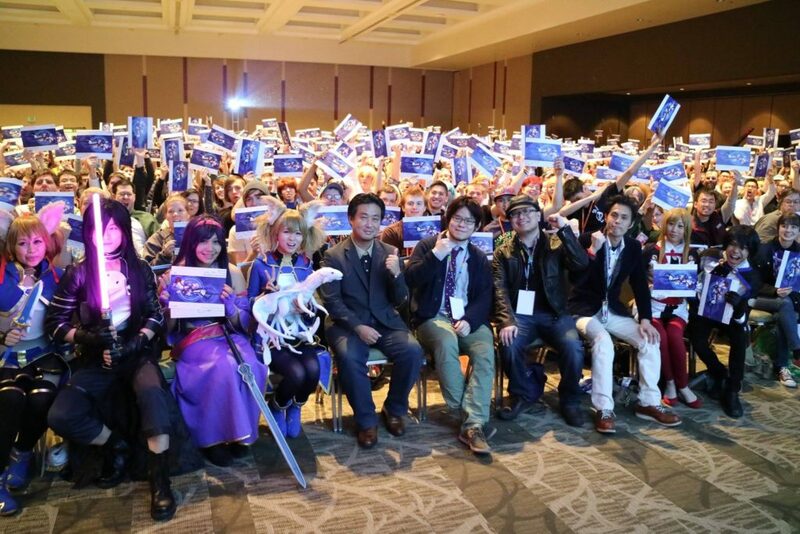 A group shot of everyone at the SAO event at SakuraCon 2016. You can barely see my poking in between people 4 rows back, on the left hand side. The event was awesome and we’re very excited for the upcoming movie! Happy 15 weeks exactly, Waterbear! Here is a photo of day two of SakuraCon2016 where I dressed up as a sparklefox. 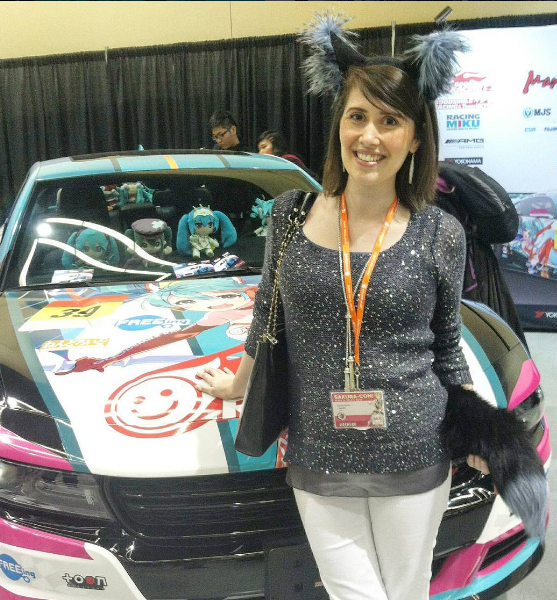 Behind me is the Hatsune Miku car! Waterbear also tagged along with James and I for some local volunteering we participated in at the Bernie Sanders’ campaign rally in Seattle. Waterbear also attended our and its very-first caucus! 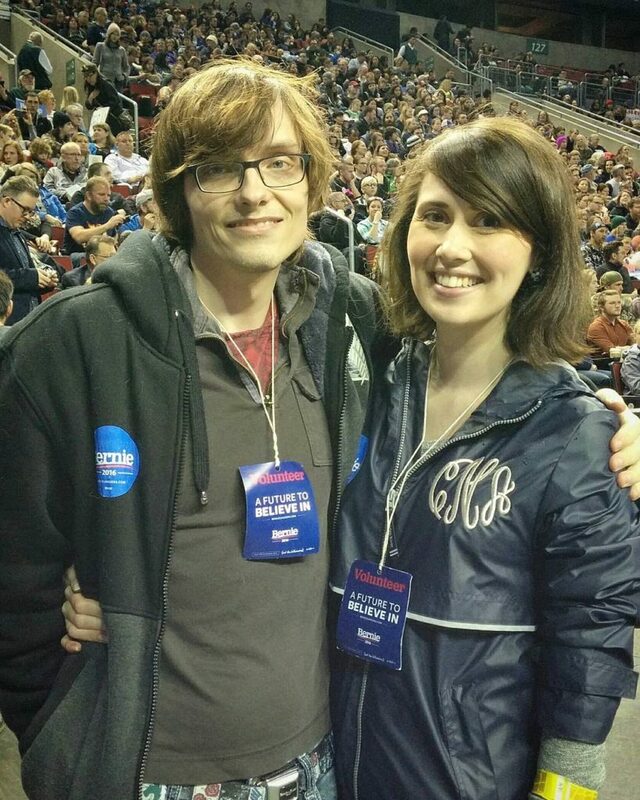 James and I volunteered at the Bernie Sanders rally on March 20th. Here we are in the press pit just before he spoke! Waterbear is 14 weeks along in this photo and would later attend his very first caucus for the primaries at around 15 weeks’ gestation. 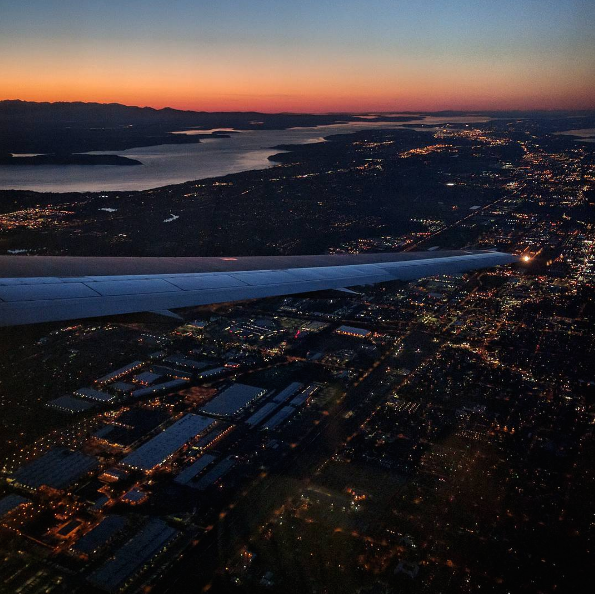 In the latter half of April, we attended a Hatsune Miku concert in Seattle and hopped aboard a flight the next morning for a week to Minneapolis, Minnesota where James spent a week for business. Mama and baby worked in walking 3 miles per day exploring downtown and sampled a ton of great food. 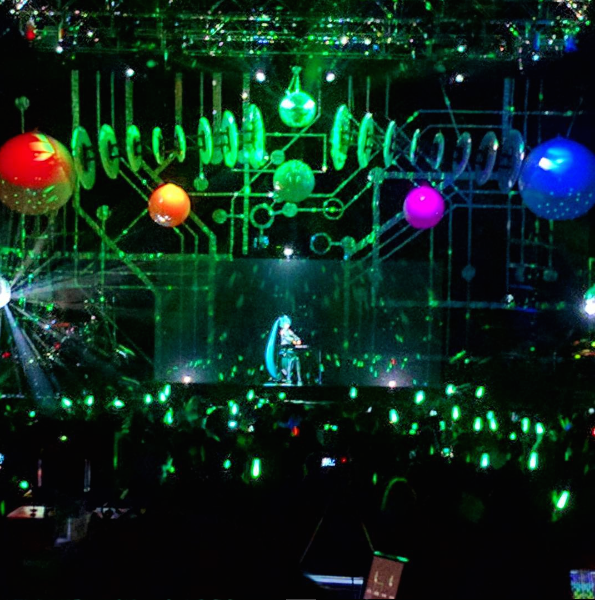 Here is a scene from our seats at the Hatsune Miku concert. Waterbear’s funny habit of sitting on my bladder first happened on this night. 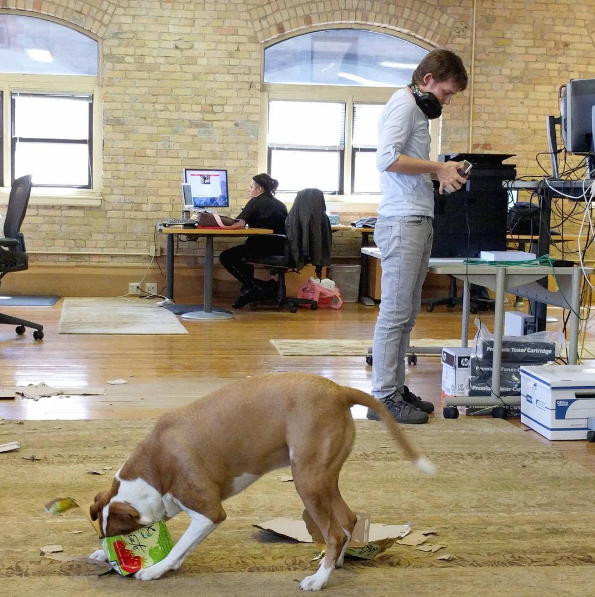 A candid shot of James working in the office in Minneapolis. The office pup was a lot of fun and is a companion to one of his coworkers. Thinking of you, Waterbear! We picked up a book for our little one while on our trip. Great children’s book about every child’s unique abilities and that family extends far beyond blood relation. A quick capture of our landing in Seattle after our big week in the midwest. We attended an Infant CPR and Safety class when we arrived back into town at the hospital as part of our set of baby prep classes! James performed exceptionally well during class and received compliments from the teacher. Here is a short list of some bump photos I’ve taken over the last little bit! I usually feel so much bigger than I actually am during the time of the photo, but look back and remark about how small Waterbear was during that week. We’re only growing from here! 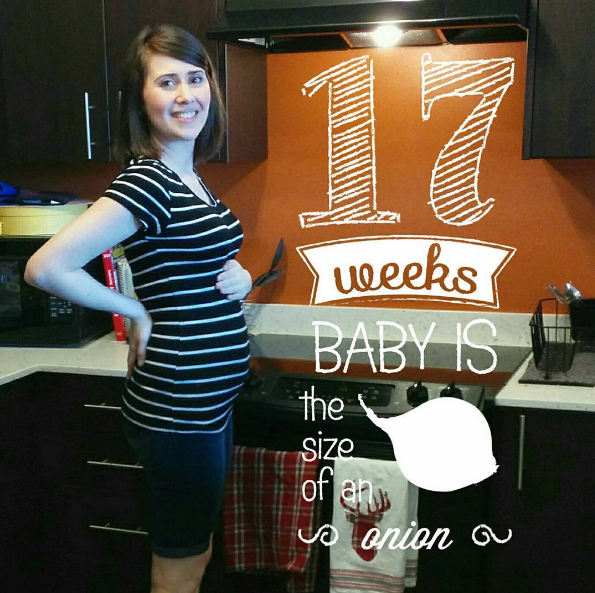 Happy 17 weeks’ gestation, Waterbear! 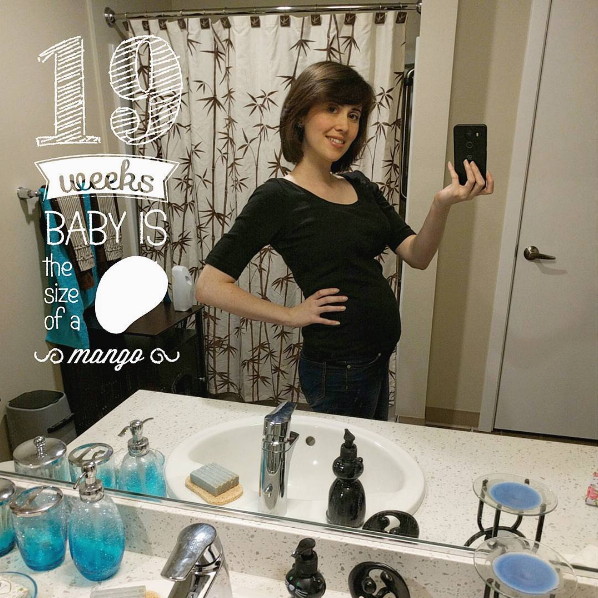 This week, I felt like I’d started to pop and show a bit more obviously. Officially changed into maternity clothes during this week. Hello, Waterbear! We were still curious whether our little ‘bear would be a he or a she this week. But we were both excited to see a belly emerge! Hello from Minneapolis! Waterbear hit the halfway mark while on the trip to Minneapolis. First kicks were felt over this trip! Mama and baby were very active this week, walking 3 miles per day! On April 5, Waterbear and I attended a general check-up at our midwife clinic and all was well with that appointment. Waterbear dated in right at 16 weeks at this appointment. We found Waterbear’s heartbeat on the doppler as usual. I weighed in at 131.6 lbs, still inside of a healthy weight gain class for my 16th week. I also had a nice reading of my blood pressure at 110/64. No new symptoms were reported there, other than some mild fatigue that comes and goes. While on the flight to Minnesota, we hit another milestone of feeling baby’s first kicks! Baby was kicking away as we walked through downtown Minneapolis. We’ve since discovered that there is a distinct pattern to Waterbear’s middle-of-the-night kicks. When James works very late, I usually wind up waking up around 3am to little kicks, but as soon as James comes to bed, baby becomes much more settled. Baby is very-much a night owl and loves to be near James! 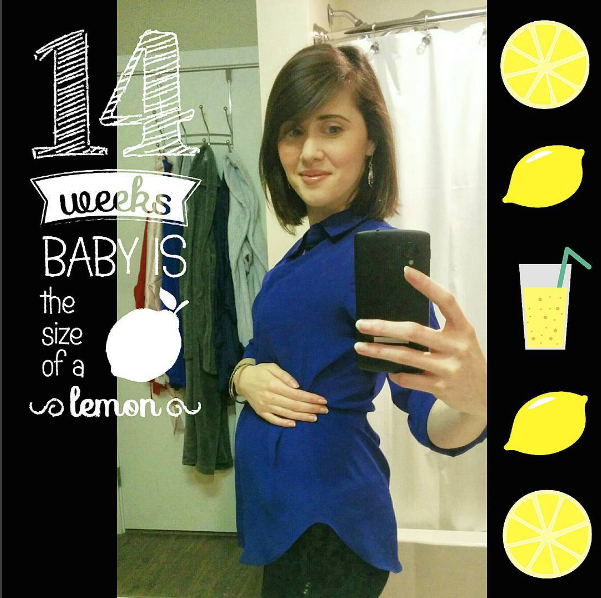 This catches us up on the goings-on right at halfway through pregnancy! 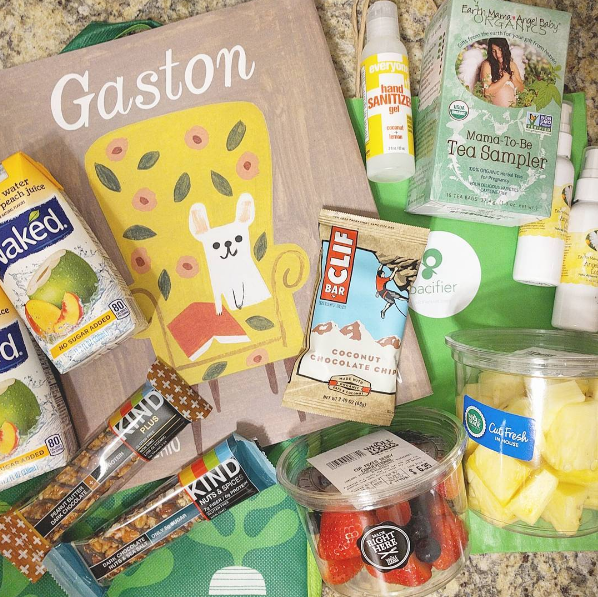 In our next post, we’ll do a full update on the results of the Second Trimester Screen, weeks 21-24, the much-anticipated gender reveal over my very first Mother’s Day weekend and our Asheville baby shower! 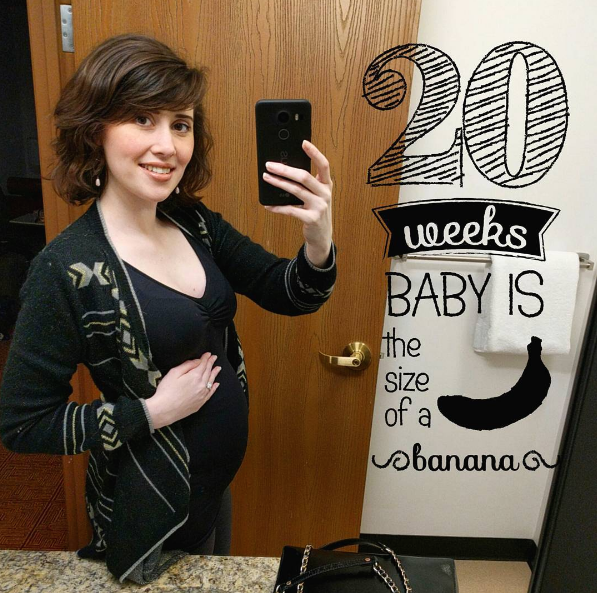 ← Second Ultrasound, Genetic Testing and the end of the First Trimester!